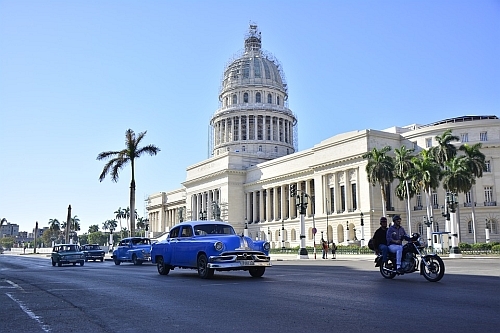 Interjet is showing flights from Vancouver to Havana, Cuba for $338 to $348 CAD roundtrip including taxes. However, the layovers are pretty long. The fastest flights have a 6 hour stop in Mexico City on the way there, and 4 hours on the way home. 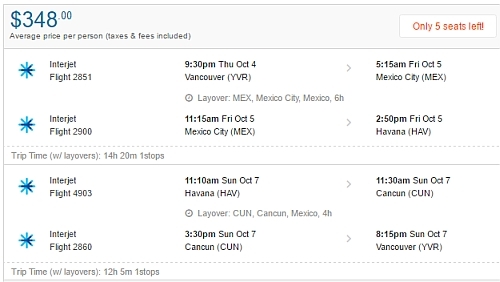 There are some dates that have a 22 hour stop in Cancun on the way home. Most flights are bundled as part of a pre-packaged trip, and those are usually much faster flights (Air Transat has some that are non-stop). NOTE: After your Flighthub search completes, click on 'Flexible Dates' to potentially see more dates around the same price.